Three months after the earthquake, tsunami and nuclear disasters that struck on March 11, Japan has plunged from an advanced and well-managed consumerist society to an epicenter of planetary radiation and imploding social and bureaucratic apparatuses. While the Japanese government is desperately attempting to maintain its sovereignty, it is unable to solve the amassing problems. In the broad picture, the national territory is being divided up into enclaves of inaccessible regions and the national economy is sinking into the abyss. Since the 1970s, Japan’s technology, along with its society and bureaucracy, established a model for innovation. The international business community and conservative forces alike praised Japan for efficiency and good management. The events of 3/11, as the disaster is now known, revealed both the immense problems inherent in nuclear power and the failings of the bureaucratic system, technology and civil society that make up the apparatus called Japan, a pinnacle of modern industrial civilization. One result appears to be the formation of a “global nuclear regime.” Capitalism has no intention of abolishing nuclear power. Instead, it is re-organizing the technocracy to manage it primarily by managing nuclear disaster, forcing people to live with different forms and degrees of radiation. The management of nuclear disaster may develop into a strategy for profit making, rule and control. Nature estimates the clean up may take a century, and the Japan Center for Economic Research puts the costs over the next 10 years at $71 to $250 billion. Japan’s government will likely assume the liabilities of the Tokyo Electric Power Company (TEPCO), meaning the public will pay. Those funds will flow to corporations, while capital will pressure the government in coming years to make the huge swaths of land now rendered inhospitable available for profit-making enterprises. Fukushima is a new form of nuclear war, no longer being fought between the states, but between the global nuclear regime and all life forms including humans. The first rescue units and corporations that showed interest in Fukushima were from the United States, France and Israel. Leading developers both of nuclear weapons and energy, these nations are in a position to play a central role in a global nuclear regime. Some of the first clean-up contracts have already gone to firms in California and France. 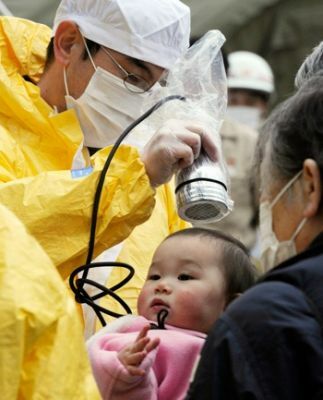 People in stricken areas such as Fukushima prefecture, location of the Fukushima Daiichi nuclear energy plant where the reactors melted down, continue to suffer from physical devastation and intense radiation. Some 140 miles away to the south, the 13 million residents of metropolitan Tokyo are enveloped in an invisible cloud of low-level radiation. We know now that three of the plant’s six reactors experienced complete meltdowns a few days after 3/11. Reactor 1 began melting down five hours after the earthquake, which, contrary to official reports, caused the reactor’s cooling system to fail, not the subsequent tsunami. The breadth of the cover-up by the government and the quasi-public TEPCO, compounded by the fact most corporate media outlets downplayed the dangers, is evidence of a general disregard for the health and safety of Japan’s population as well as the rest of humanity who will be exposed to the radiation sooner or later. The cover-ups, similar to the official whitewash of the health dangers to New York City residents following the months-long toxic fire after the 9/11 attacks, shows the overriding concern is to maintain business activity at all costs. Is Fukushima an ecological disaster? It is a natural and man-made disaster. It is a disaster caused by capitalism. But all in all, it is the self-destruction of the whole of the systems run by capitalism, the nation and the state. While the democratic uprisings in the Middle East and North Africa may seem unrelated to Fukushima, revolution and disaster are connected. The Arab Spring and 3/11 may be rooted in different modes of being and subjective identities and relations, but they both derive from the same system of capitalist expropriation and in turn represent an unprecedented threat to capitalism. Revolution and disaster together are forcing the planetary apparatus to undo and redo itself. In this sense, they are “One Event” in the ultimate dimension, the dimension where the world and the earth clash and interact. The events of 3/11 expose the fundamental paradox of human laws regarding nature. The well-being of humans depends upon the well-being of nature. But the law assumes nature is a mere object, mere resources to exploit. Laws are designed to expropriate, privatize and divide the ultimate commons called the earth. If we think about the rights of mother earth we must accept limiting the unilateral rights of humanity. Fukushima 3/11 has unveiled the discrepancy between the world and the earth. The world is the stage where human societies play out the drama of their interactions with structural languages such as international politics and laws. The earth is the factory that produces and reproduces the players and the stage themselves but by using different languages that are machinic (in the words of Felix Guattari). The machinic operates differently from the structural in that it penetrates through and moves between the conscious and the unconscious in the planetary whole. In this sense, Fukushima 3/11 is not associated with “the world.” The event radically questions the concepts associated with the global governance such as G20, the United Nations or Empire, mainly consisting of the representatives of nation-states and capital. These representatives cannot embody a will to solution but only to manage the problems of all the discrepancies between humanity and nature, the world and the earth. The nature of the event lies on the level of the unconscious called the earth, upon which the apparatus is built and we live everyday life without thinking. The unconscious earth surfaced in the conscious world in the form of natural disaster and began to open fissures in the apparatus that had been expanding larger and larger, and embedded deeper and deeper into the planetary body, becoming one with it. The implosion of the apparatus took place at the forefront of the merger where the language of the planetary unconscious is now shaking everything about being human, its being, subjectivity, society, history and the world. There are the stirrings of a global movement to oust capitalism, the nation and the state, to undo the apparatus, but we are also headed toward collective suicide in a world whose immiseration and oppression are getting steadily worsening in the post-3/11 climate. If such a movement is coming, an ultimate class struggle between the global nuclear regime and the living beings — it will have to be fought within world politics to a large extent. Its real and potential battleground will be the planetary unconscious or the ultimate commons called the earth, the nurturing mother and the goddess of wrath at the same time. The struggle will be unprecedented. The forms it takes are yet to be discovered. The only certainty is that it will involve not only the negotiation processes called politics, but also everything about our minds, society and ecology. Sabu Kohso is an independent writer and translator of Japanese origin, living in New York City. He is currently working on a blog jfissures.org in the wake of 3/11.